Section 1.1 Basic Lease Provisions. Section 1.2 Effect of Reference to a General Lease Provision. Each reference in this Lease to any of the General Lease Provisions contained in Section 1.1 shall be construed to incorporate all of the terms provided under each such General Lease Provision. Section 1.3 Exhibits. The exhibits listed in this section are attached to and are hereby incorporated in this Lease by reference, and are to be construed as a part of this Lease. 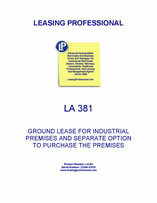 Exhibit A contains a legal description of Leased Premises. Exhibit B contains an Option Agreement granting the Tenant an option to purchase the Leased Premises on the terms and conditions specified therein.. Section 2.1 Property Owned by Landlord. Landlord is the owner of that certain real property located in the County of _____________, State of ____________, more particularly described in Exhibit A. Section 2.3 Term. Landlord hereby leases the Leased Premises to Tenant for a term commencing on _____, 19__, and ending on _____, 20__. Section 2.4 Renewal. Provided that Tenant is not then in default hereunder, Tenant shall have the right and option to renew and extend the term of this Lease for two (2) additional consecutive periods of five (5) years each upon notice to Landlord pursuant hereto given at least sixty (60) days prior to the expiration of the initial or any renewal term hereof, as applicable. Section 2.5 Option to Purchase. Contemporaneously herewith Landlord shall and does hereby grant unto Tenant the exclusive right and option to purchase the Demised Premises in accordance with the terms and conditions set forth within Exhibit B. Section 2.6 Memorandum of Lease. Upon the request of the other party, Landlord or Tenant shall make, execute, and deliver a memorandum of lease, suitable for recordation.